In Hollywood, BitTorrent is often framed as a threat due to its pirate stigma, but the technology also offers opportunities. BitTorrent Inc, the company behind the popular uTorrent software, helps artists to legally distribute their work to millions of people every year. TF can now reveal that Sony Pictures’ interest in the technology was so concrete that the movie studio listed it as a potential acquisition. 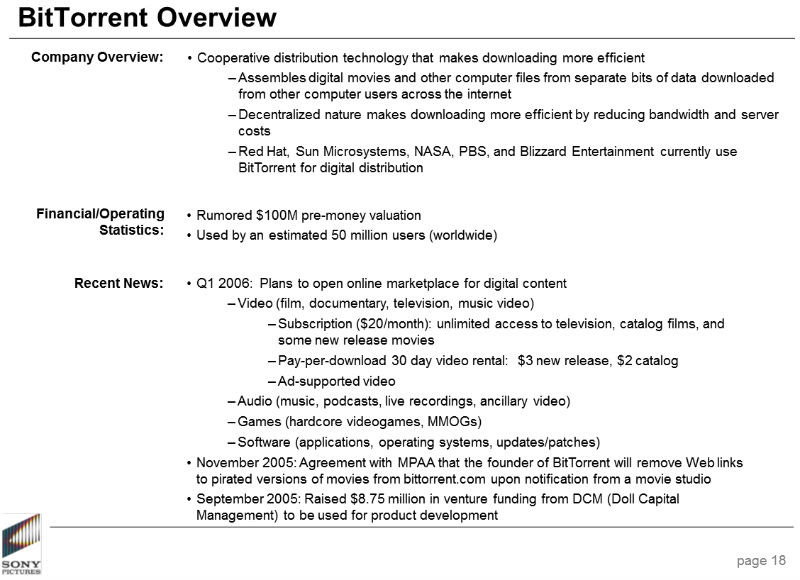 In a draft presentation from early 2006 BitTorrent flanks other buying opportunities such as TiVo and Netflix. The Sony presentation discusses options to “refine” its business and saw BitTorrent as a potential candidate to diversify. Among other things, buying BitTorrent could improve margins and facilitate growth. To accomplish this goal Sony could invest $2 to $4 billion dollars, certainly enough to buy BitTorrent. Even Netflix, which didn’t offer video streaming yet, was within reach based on a $1.2 billion valuation at the time. 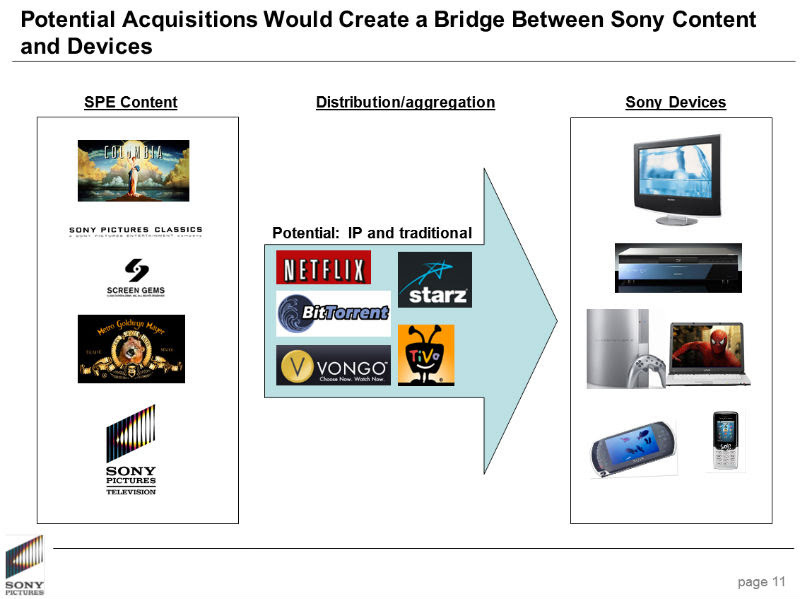 According to the presentation the acquisition candidates would bridge a gap between Sony’s entertainment content and the company’s technology devices. In the case of BitTorrent this could facilitate the development of set-top boxes and TVs with built-in technology to download and play video content. This is an area BitTorrent was already working on with other partners. In an overview sheet Sony sums up some of BitTorrent’s strengths as well as recent developments. It mentions the agreement with the MPAA to keep infringing content off its website, among others. Sony was also aware of BitTorrent’s plans to launch its own entertainment store. This eventually launched a year later but never got any real traction. Despite the enthusiasm Sony never bought BitTorrent. The company went for Grouper instead and eventually bought a 25% stake in Starz Media as well. Today almost a decade has passed, and in hindsight it’s not necessarily a bad decision for Sony to have passed on BitTorrent. The company has a massive userbase but struggles to find good revenues sources. Netflix, on the other hand, is definitely a missed opportunity as the company now dominates online media distribution worldwide.